One of the most important skills that a student has to learn, ANY student, at any level, is that of time management, and a PhD student is not particularly unique in that. Where we differ from undergraduate or even masters students, however, is in the time we have available to us with little in the way of specific externally imposed goals. Most of us will have two, absolute goals that have to be met: the Thesis and the Viva, and most, if not all, will have to meet targets imposed by their university: reviews, supervisions, reports and so on. That means there are large blocks of time where there is little external pressure to achieve things. New students are warned, going into a PhD, that we have to be responsible for driving our PhD forward, managing it ourselves, and not relying on our supervisors to do it for us. That sort of discipline can be difficult to learn. What can also be difficult is in balancing and driving forward the different parts of the PhD, particularly the parts that ‘feel’ less urgent (e.g. the bits that don’t have an externally imposed deadline). It’s always easy to let secondary reading slide, for example. And while there are a number of different tools and methodologies for managing different projects which can be useful to the PhD student, different projects and balancing them also very much impact on our time management… or at least, have the potential to cause problems there. Eighteen months ago, I stumbled across something called Bullet Journalling. I’m not alone in this: any number of students around the world have discovered it and are using it to aid and manage their studies. One of the key strengths of this system lies in the fact that it can be tailored to suit you, the user. Another, is in its simplicity. All you need is a notebook, and a pen. Actually, scratch that. All you really need is something to write on, and something to write with. you write the date at the top of your page. then you list what you’re going to do that day, your tasks, like this. You can use a series of ‘bullets’ – that’s the various squiggles on the left of the right page – as signifiers, or a key to the different items, and there’s no limit on space. If you want to list 3 pages worth of bullets, you can (although I would question whether you’d get them all done!). I’m sure some of you are thinking “sounds like a to-do list to me” … and yes, to a certain extent, it may be that, although it’s more than that: you can record other things too, appointments/events, and you can make notes. So that killer quote you overheard in the library cafe: pull out your journal and jot it down on the next available line. You see a fab chart that just happens to explain the balance between primary sources and secondary sources in a dissertation and when you should be using each in which bits of it (that actually happened to me!) … you can devote the next page to copying it down. The kind of stuff you’d record on post-it notes and lose – no longer. Now, stick ’em in your bullet journal. It gets more complex than that, however. Obviously, you’re going to want to remember this killer quote when you’re writing your thesis…. so you need an index. and you need page numbers. And, since you write this journal as you go (remember, each day has as much space as you need?) how do you handle appointments in the future? The inventor of bullet journalling has a great starting point here, but as I said, one of the key strengths of this system is that you can adapt this to make it work for you. If you hate the idea of using a dot to signify a task, fine. I have boxes, myself (colouring them in to say they’re done makes me *ridiculously* happy and it is embarrassing how much of a motivator that is for getting things done. My one solace is that I’m not alone in this). If you find that their suggested way of recording appointments in the future just doesn’t work for you, great. Use a different way. [Myself, I record appointments in google calendar – it means this stuff is managed on my smartphone and goes everywhere with me (even if my journal stays at home), and my partner can see it too.] If you like systems with different coloured pens and diagrams and you like drawing and doodling… oh man. 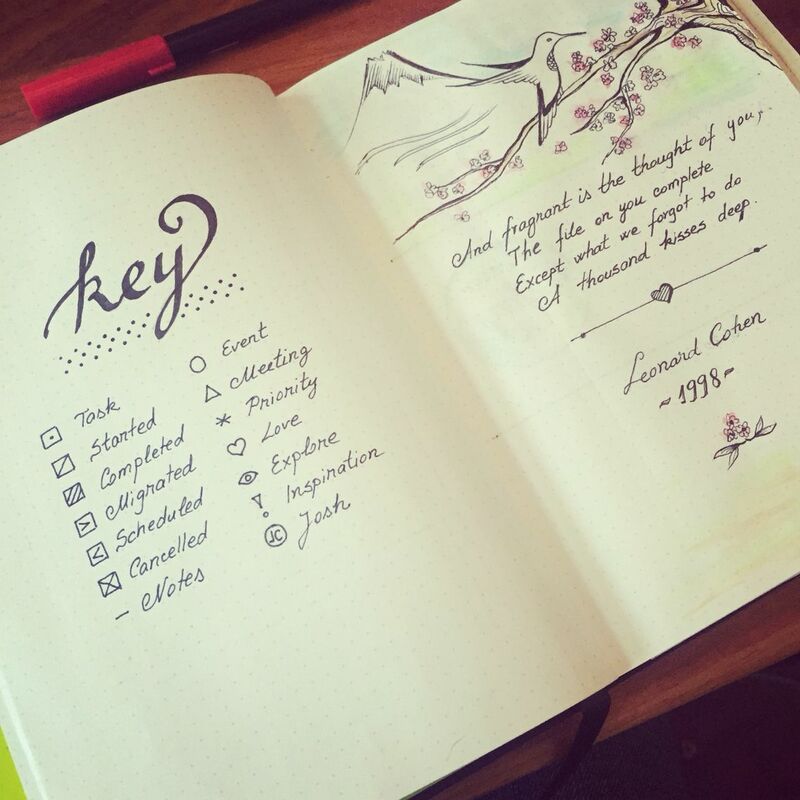 Bullet journalling is TOTALLY for you! Even better … there’s a huge, and I do mean HUGE community out there on the internet of other people using bullet journals to manage their lives in a myriad of different ways. If you’re new to it, I would recommend holding off on going that route – and for heaven’s sake, please do NOT google image search bullet journal or Pinterest it – going that route is well and truly a major and very deep rabbit hole and this is meant to be about improving your efficiency and time management not distracting you from your PhD…! There are a lot of very highly decorated, artistic journals out there and for some that can be intimidating and off-putting. However, if (despite what I said), you looked anyway … I think its important to reitirate that bullet journalling is not about having a highly decorated, very colourful journal, necessarily: at its core, it’s a pen, and a notebook. Nothing more, nothing less. But I can hear you ask: … if bullet journalling is such a rabbit hole, why should I start? Well, here’s what it’s done for me. Since I discovered it, I’ve graduated from my MA, pulled together a PhD application and won funding for it, written and delivered 6 conference papers, written and delivered 5 public history talks and won a general essay prize. I’ve started my PhD, which is going well. My productivity has gone from strength to strength, but more importantly, I feel confident that I’m able to remember things when I said I will do them. I’m managing my goals and my projects. Things in my life are getting done, and I’m happier than I have been in years, mostly because I also use my journal for self-reflection. My physical health is better than it has been in a long time. I’m not alone in noting all this. Many people have noted that keeping some form of paper and pen-based record improves their lives, that the act of putting pen to paper aids in so many ways. Bullet Journalling specifically has many benefits; creativity; better mental health; productivity; for us students, there are so many articles out there. The more astute amongst you may note that although I’ve extolled the virtues (many) of the bullet journal, I’ve not said a great deal about how I use it. That’s quite deliberate. My journal is highly personal, and also very unique to me. And I suppose I also don’t want anyone reading this to take away the message that my way is the right way. It is – for ME, but not necessarily for anyone else. There are no shortcuts to this: You have to read the inventor’s website (bulletjournal.com). Go on! grab a pen. grab a notebook. get going! Try the system, make changes. You won’t get it right immediately – there’s a process, over several months, of trying things, seeing what works, scrapping what doesn’t. You may conclude, at the end of the day, that this system is not for you, and that’s perfectly fine – it won’t suit everyone. But I’m willing to bet that there are many people who will like it, and who will find it something completely lifechanging. And if you do try it, even if you conclude that it’s not for you I’m also willing to bet that you’ll come out of it with a better understanding of how you work, what you need and what you don’t need. All of which is good stuff to have. So… go for it. What have you got to lose?